The month has ended how it began with beautiful early autumn days of blue skies and sunshine, while there is a decided chill in the Somme air in the morning and evening. We have had a busy month – there is always something going on here, but it is our guests and their intriguing and poignant personal stories they bring as they explore The Somme that make this place so special. 100 years ago the War entered a critical new phase: The Allied armies deployed new tactics to overcome the stalemate of trench warfare. By the end of August there were over 1.4 million American troops in France. The arrival of these fresh troops made a huge contribution. Allied artillery dominated the battlefield paving the way for a breakthrough. However, German machine guns hindered their advances. By late September the Allied forces were facing the Hindenburg line, a series of heavily fortified positions that formed the main German defences. It had to be broken to ensure Allied success. 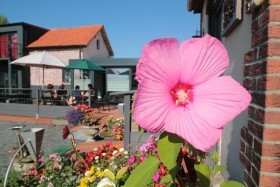 Colleen Costick has visited the region for many years and was one of our first guests at No.fifty6. 4th September 2018 marked the centenary of the death of her grandfather Joseph Samuel Heath who had inspired her love of the history here. 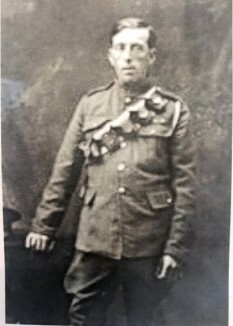 Joseph served with The Queen’s Regiment, Royal West Surrey, and at the age of 43 had a family. He was tasked with clearing the village of Bouzincourt of mines left by the retreating German army. It was while doing this that Samuel lost his life. The village of Bouzincourt have been grateful to Samuel for making sure their village was safe for the inhabitants to return. He is the last recorded date of death in Bouzincourt Communal Cemetery extension. 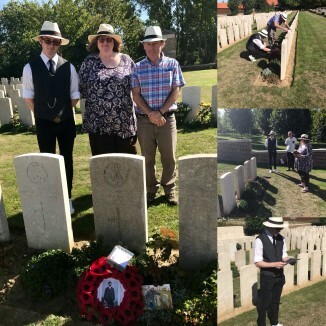 On 4th September Colleen along with the Maire and village of Bouzincourt arranged a special ceremony to mark his death, but also to remember all the men who lie in Bouzincourt cemetery. 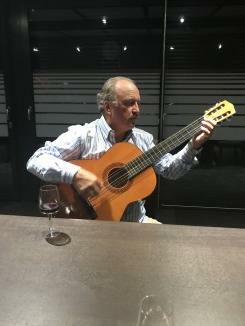 Our friend Cyrille Delplanque played the lament on the bagpipes and after short addresses there were acts of remembrance. The children from the village school attended and laid a poppy on each man’s grave. It was a beautiful service. Chris and Bill Prince visited from Perth, Western Australia, their first visit to the battlefields. Both Chris and Bill have relatives who fought and died here and they themselves had served their Nation in the Australian Navy. 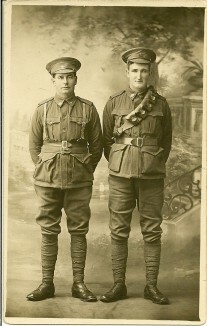 Chris and Bill both have great Uncles who died as a result of the actions at Pozieres. Private Norman Taylor of 28th Battalion died between 6-8 August 1916 at Pozieres and has no known grave, so is commemorated on the Villers Bretonneux Memorial. Chris’s great uncle is Lance Corporal Frank Byrne, of the 13th Battalion who was wounded on 29 August 1916, at Mouquet Farm, and died 12thSeptember 1916 at the 13th General Hospital, Boulogne and is buried in Boulogne Eastern Cemetery. As well as making pilgrimages to these locations, Chris and Bill visited the graves and memorials of others in their family who paid the ultimate price. Henry Bateman, 37th Battalion died 6thJune 1917 and is remembered on the Menin Gate; Thomas Orton, 2nd Division Salvage Company, died 16th September 1917, buried in Huts Cemetery, Ypres; Horace Lathby 11th Battalion died at Bullecourt 11thApril 1917 and has no known grave so is remembered at Villers Bretonneux; and Roy Jamieson died at Fromelles 19th July 1916 and is remembered at VC Corner. One family, with many of their young men lost to War. Sue Eltaif came to remember her grandfather Corporal M Carrick of the 1st/5thBattalion Loyal North Lancashire Regiment who died 28thAugust 1915 and is buried in X Farm Cemetery. He left behind his family. It was a poignant pilgrimage Sue made, stunned by the beauty of her grandfather’s resting place. Alison, Paul and Tom James have been visiting The Somme since 2008. Tom particularly, as a 9 year old in 2008 became fascinated with his family ancestry, a passion which Tom still has. On a visit in August 2011 Tom found his Great Great Uncle’s grave on the last day of their holiday thanks to the databases at Thiepval. James Jesse Lyman MM was one of 7 Lyman brothers who went to war, one of whom Stanley, is Alison’s grandfather. Of the 7 boys, James was the only one who did not return. Serving with Oxford and Buckinghamshire Light Infantry he died near Havrincourt near the Canal Du Nord on 11th September 1918 and is buried in Hermies Hill Cemetery. Tom has extensively researched all the brothers and has photos of them all. He has however, never been able to find out why James was awarded the Military Medal, awarded posthumously. The James family were adamant they would be here to honour the 100thanniversary of James’s death. We went with the family to Hermies Hill on a beautiful but breezy 11th September. Alison had written a letter which she read out, and Tom said a few, poignant words. We played the Last Post and had a moment’s silence. Tom then laid a wreath along with photos of the 7 brothers at the graveside, all reunited. In November, Tom will be exhibiting his research and photos at an exhibition of remembrance at the Gayhurst Estate, Buckinghamshire where James Lyman is on the war memorial in the church and he is also remembered on the war memorial in the village of Stoke Goldington. David Alderson and his mother Mavis visited to remember grandfather/great grandfather George Henry Jeffries of the 1st/6thDurham Light Infantry who died 16th September 1916 and is remembered on The Thiepval Memorial. George Henry had a brother, Enoch Jeffries of the 2nd Battalion Durham Light Infantry who died 9th August 1915 and is remembered on the Menin Gate. 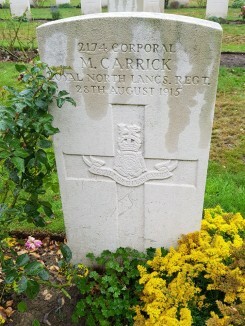 His poor mother and father from Bishop Auckland, lost 2 sons, both with no known graves. David discovered that George Henry’s name was incorrectly spelt on the Thiepval Memorial so has been in correspondence with CWGC to get the name corrected. This was the first time he had seen the corrected name and was full of praise for the CWGC. Can you imagine being Mrs Ford and receiving notification that your son has died, only to receive a letter from that very same son dated a week after he was said to be killed? Tony brought with him the letters his mother wrote to The War Office, pleading for further information, and it took the Army some time to sort out the mix up due to service numbers, changing regiments etc. From the documents it seems that the Army were more concerned with getting their paperwork straight rather than keeping the distraught mother informed. There is a sad and ironic postscript to the story as the erroneous notification of death was indirectly responsible for Bernard’s death. Bernard Ford returned home but suffered the effects of War. At the age of 57 he went upstairs to get the piece of correspondence which had prematurely announced his death to show a friend, and while doing so had a heart attack and died so Alex and Tony never knew their Grandfather. Alex and Tony Ford, made their pilgrimage to the grave of Thomas Ford, 100 years to the day that he died. The man who was not their grandfather. Finally this month, James and Avril Mclaren-Rowe came from Nutley, Sussex, to remember their Great Uncle. 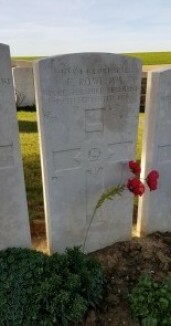 Corporal Frederick Arthur Rowe MM served with the Worcestershire Regiment. The Worcesters attack on 29th September 1918 led to many deaths but it was a pivotal part of the breakthrough of the Hindenburg Line which was achieved that same day. The men of the Worcesters are buried together in Pigeon Ravine Cemetery very close to where they fell. A beautiful place, the easternmost CWGC Cemetery on The Somme. James and Avril met other families in the Cemetery who had come to remember their kin too, 100 years to the day. It was an emotional day for them. All of these are extraordinary stories of courage, loss, remembrance and sacrifice. It is one of the reasons The Great War is relevant today, touching so many families as it did and changing so much. We Will Remember Them. This month we welcomed the lovely Len and Julienne Chaganis who spent a weekend restoring the Donald Bell Memorial in Contalmaison. Donald Bell was the only English professional football player to be awarded the Victoria Cross. He left a promising football career where he was known for his speed and tenacity, to join up for the war where he served as a Second Lieutenant with The Green Howards. On 5thJuly 1916, as Bell and his men made their way towards their objective, Horseshoe Trench, they immediately came under heavy German machine gun fire. With his men caught in the open, Bell traversed down a communication trench with a junior NCO and a private and destroyed the post with small arms fire and mills bombs. Bell’s bravery allowed his battalion to eventually capture their objective and also saved the lives of many of his men. For this, he was awarded the VC. Bell was a reluctant hero, however, and sent a letter to his mother soon after the action in which he wrote: ‘I must confess that it was the biggest fluke alive and I did nothing… I chucked the bomb and it did the trick.’ If it was luck, Bell’s share finally deserted him on 10 July during a similar attack on a German stronghold. Leading his troops across open ground near the village of Contalmaison, the 25-year-old was cut down by machine gun fire and died where he fell. His body was later buried by his men and a wooden cross erected in his memory at a position soon to become known as Bell’s Redoubt – the site of the memorial today. After the War his body was relocated to Gordon Dump Cemetery. Len and Julienne painstakingly cleaned, repainted and repointed the Memorial in Contalmaison and it looks as fresh today as when it was unveiled. Well done Len and Julienne, unsung volunteers who have done an amazing job. David and Mavis Alderson on their travels near Villers Bretonneux met 3 intrepid Australians who were cycling the Western Front on old bikes, dressed in Word War One uniforms. On their return to no.fifty6 Mavis and David told us about their encounter with these wonderful Aussies. The next day, the Aussie cyclists stopped to look at our tank in the garden as they cycled up our road, and we welcomed them in for much needed refreshment. Steve Talbot, Vaughn Dixon and Andrew Seymour from Victoria, Australia are indeed cycling from Villers Bretonneux to Ypres in reproduction uniforms and old (gearless) bikes, with only themselves and what they could carry as support. Their own Personal Pilgrimage. The 3 gentlemen left us a special memento of an original uniform button, and they cycled off suitably refreshed. They have now, we are happy to say, made it to Ypres. They commented on how friendly everyone they encountered en route had been. Gentlemen we salute you. 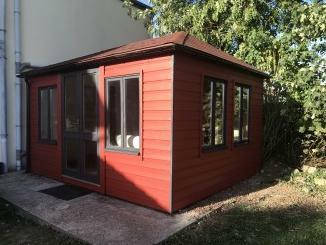 With autumn approaching we thought it was time to do some exterior maintenance. So our trusty builder Greg has been back a few days this month to help us with exterior paintwork. We have painted the exterior of the Garden Room, and have painted all the guttering, pipes, window frames, sills and woodwork at the back of the house. It is looking shipshape again and ready for the ravages of winter. Our brood of chickens are adventurous and chatty. One chicken – Georgette has been a little too adventurous this month. The girls love to jump up as you get their food and Georgette landed rather awkwardly jumping off the food box and twisting her leg. Our chicken man Michel checked her out and said it was just a sprain and not to worry about it. She is limping (have you ever seen a chicken with a limp?) but otherwise she is fine and it is not stopping her doing anything. From the 6 hens we continue to get 6 yummy fresh eggs for breakfast. 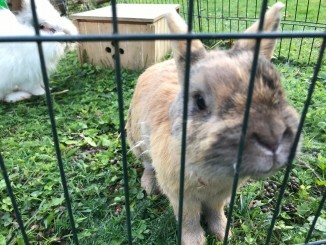 The rabbits are happier with autumn weather too rather than the summer heat! Harriet and Edie saying hello to guests in The Senna Room. Another inspiring and informative newsletter. Hope to see you both again in 2019. Never realised the extent of Coleen’s story - a real honour for her. We had a RAF VC10 named after Donald Bell VC. Again, a crackin’ read! Currently celebrating our Wed Ann in Boston, Canada, etc. For the ‘Fall’. Luv to you both. Once again an excellent and very informative read. Thank you! Regards Lawrence.